There are certain phone features that you might want to adjust or turn on for specific apps. For example, you might want GPS or Bluetooth on when using a sports tracker app, but not the rest of the time. With Autoset you can do that, having GPS – or whatever else – enabled automatically when you launch a relevant app, and disabled when you close it. Similarly, you can tweak settings, for example having the screen go brighter automatically when you launch Netflix. You can also create time-based profiles, if for example you want your phone to switch to silent at midnight. 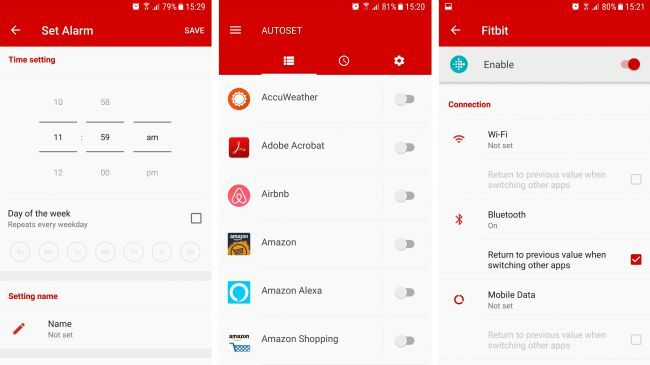 For the most part these are simple toggles, which you can set and forget, and there are lots to choose from, including Wi-Fi, Bluetooth, mobile data, GPS, mobile hotspot, rotation, screen off time, brightness, sound mode and media volume.